On Friday, November 17th at the Waving Art Gallery at the Maurice Bishop International Airport, here in Grenada, we saw a very special opening reception for Godfrey Luke’s solo exhibit. 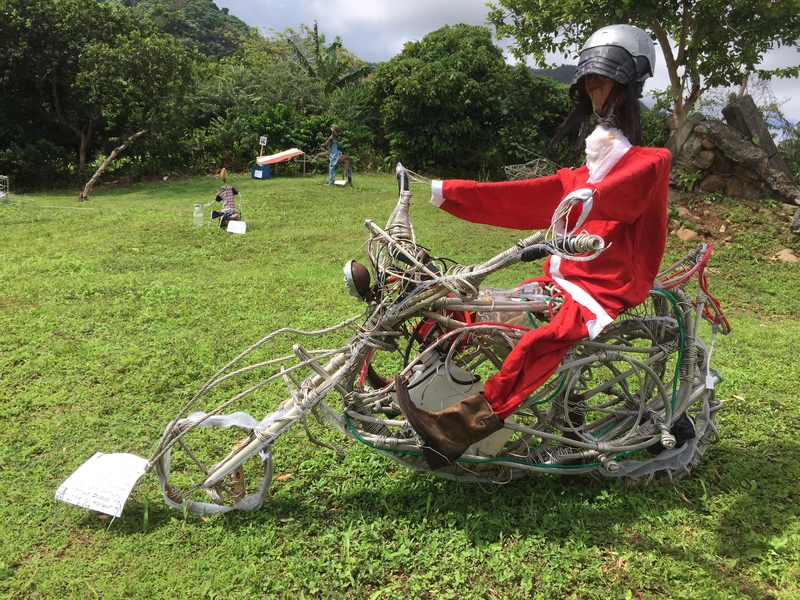 Visitors were welcomed by figures and vehicles made from found materials around Luke’s community in Upper St. John, St. Andrew’s. The figures, made of armatures of cables were padded with natural elements like coconut fibre, banana fibre, and coconuts. The vehicles, a motorcycle, car and helicopter were more reliant on recycling material that would otherwise have been discarded. Luke’s paintings round out the exhibit giving both a sense of a physical and conceptual environment. 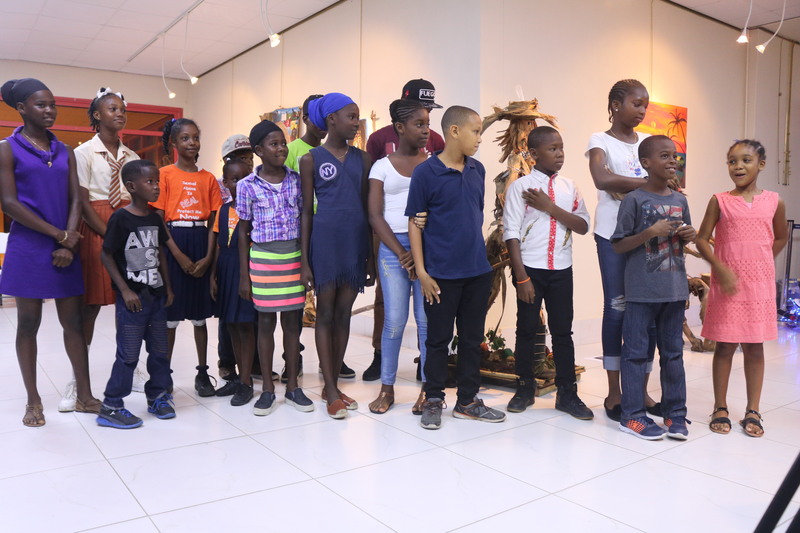 The presence of Ashanti Footprints, a cultural group from the community that consists of a couple dozen children, highlighted what makes Godfrey Luke “100% Amazing”, per the title of his exhibit. This is art. Well constructed objects based on a good concept is typical of what make a good individual artist but Luke goes further than that and incorporates the collective knowledge and experience of the community into his work. This socially-based art practice makes the beautiful sculptures secondary to the amazing level of cultural, social, and educational infusion that the community is getting based on his determination and creative spirit. What I think is important to understand in the context of Luke’s work is that in a society that prioritises functionaries of a system over human actualisation, to engage in activity that makes us more human is subversive. Looking first at his materials, Luke uses things that are familiar and common to his area. I heard many remarks as we were setting up as people saw materials they recognised and recounted stories based the memories they had associated with the material. This is the mnemonic and empathic quality of using materials that are our own, in our own art. When we see certain things we are familiar with, the material or objects “tells us” about ourselves. Many times corporations try to sell you products, services, or even movies with the intention that their audience will identify with what they are selling. If part of my identity is wrapped up in “Apple” products then the company has a loyal consumer and as an individual I have associated with a company that I perceive as representing my own individual interests. Materials and objects in our landscape have what Jonathan Chapman calls, “emotional durability” and tell us not only better stories than corporations are able to but ultimately, the materials tells us stories about ourselves. We step away from the mechanism of industrialisation when we are able to take control of our own stories and the articulation of our own identity. Further, we free ourselves from multiple cycles of capitalism, not only because in this case Luke didn’t necessarily buy his materials but also because if we are in charge of our identity and our story there is nothing that someone can sell us because we are not “enough”. I believe we should celebrate anything that is done outside the grasp of capitalism especially in a place like Grenada where so much money leaves the country regularly because of corporate interests (re: Sandals, Digicel, Flow, IGA, Grenlec, CXC, not to mention a general high cost of living, the list goes on…). Godfrey Luke, along with Judy Antoine and Ashanti Footprints are making a statement about deriving our humanity and identity through the things we are able to learn, make, and express rather than buying the latest technology or having to have lots of corporate support before moving forward. By making art in this way, Luke imbues these objects with value that goes far beyond the price on the label. Aside from the material used in the sculptures there is a definite narrative quality to each sculpture and to the exhibit as a whole. The sculptures themselves mirror life in the community. In figurative work, whether drawings, paintings or sculptures, sometimes the depiction of the human form can come across as sterile or even clinical. Luke’s figures seem frozen in mid-sentence, in mid-dance, or even sculpted while working. The characters compel the viewer to read a narrative into them and then as they are set up in the gallery they converse; they commune. When I first saw Godfrey Luke’s sculptures it was outside in Upper St. John in December of 2016. They were set up for the holiday season and many of the figures had signs next to them narrating what they were doing. There was a Santa Claus on a motorcycle lit with Christmas lights and otherwise the whole scene was surreal. These sculptures have never been disconnected from the overflow of human experience and community that is Luke and the Ashanti Footprints. Even the vehicles have containers on them with different coloured fluids which are naturally half empty, referencing the fact that in another reality the motorcycle or the car had to burn a little fuel to make it to the Waving Art Gallery. The fact is, there is no place in the world where it is easy to be an artist. 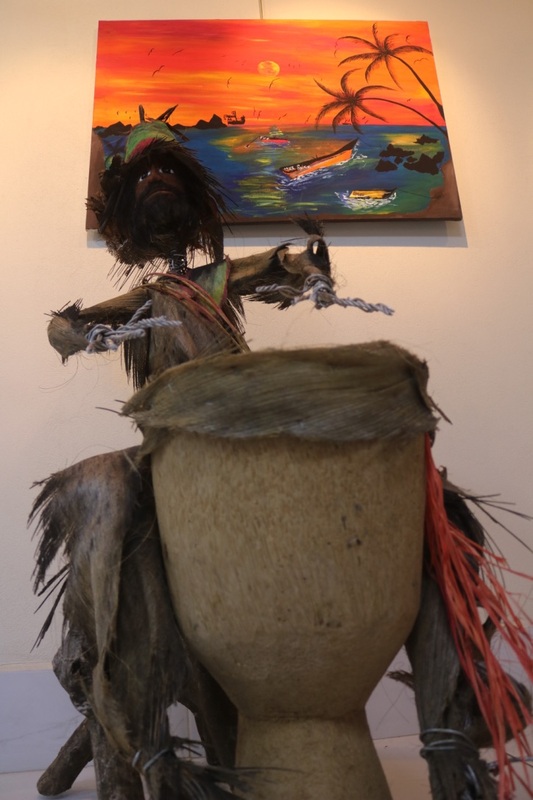 In Grenada sometimes people complain because we don’t have museums or big art supply stores but elsewhere in the world, art funding isn’t what it used to be and if you are in one of the “art world centres” the competition to be noticed for your art is fierce. It is not easy being an artist in Grenada but seeing Luke’s exhibit gives hope. We have to work with our advantages and minimise our disadvantages where ever we are in the world. 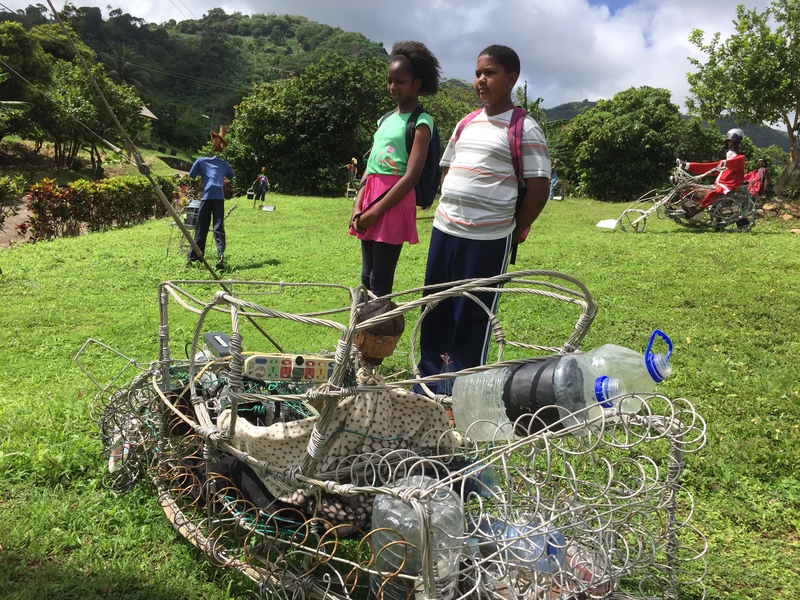 In Grenada we have a lot of freedom to work and we have a lot of natural resources and materials to incorporate into our work. With some technical understanding of how to work with these materials we can make art work that cannot be made anywhere else in the world. Our art should look like we made it during a certain time in history, in a specific place and among certain people. We are taking control of the conversation about who we are and what we make when we use the things that are readily available to us. Making art in Grenada is not easy but when great, contemporary artwork like Godfrey Luke’s comes down from St. Andrew’s, we should take notice. There are many reasons people give for why they don’t make art, or buy it, or even like it, but the example Luke shows us is compelling. Engaging with our landscape and the people in our community is making us more human. In Grenada we have materials and we have stories – thank God we also have Godfrey Luke. 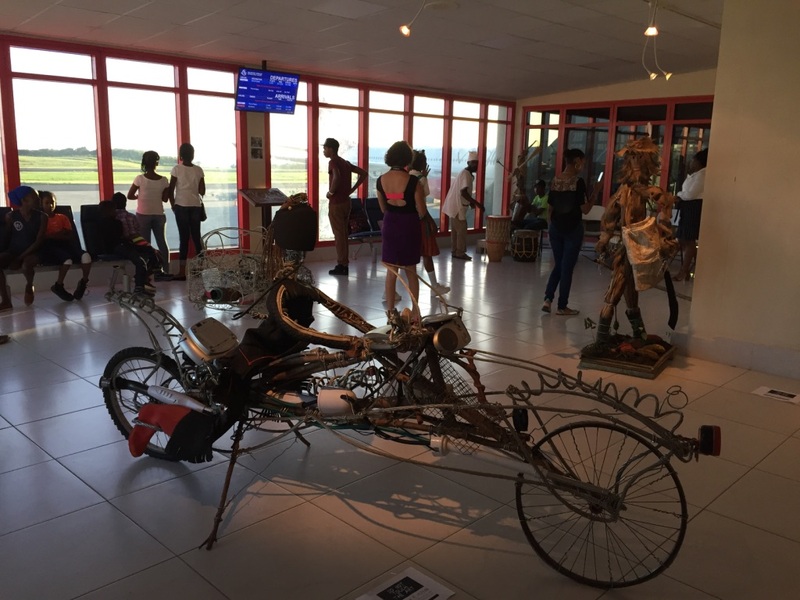 Godfrey Luke’s exhibit will be open at the Waving Art Gallery at the Maurice Bishop International Airport until Mid January 2018. 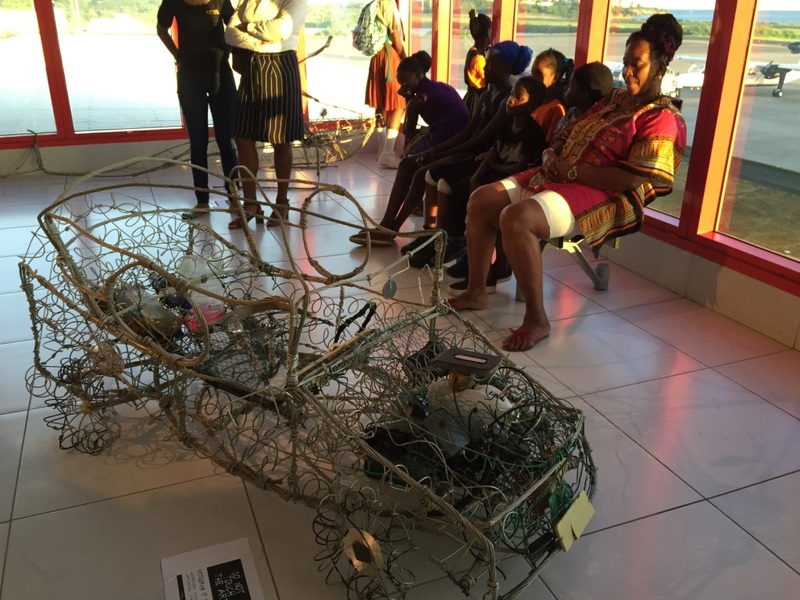 This exhibition has been made possible by the partnership between the Grenada Airport Authority and Grenada Arts Council. Godfrey Luke can be contacted directly at godfreylukeartist@gmail.com.